All crooked/twisted noses have an underlying septal deformity that requires correction and reconstruction to achieve and maintain a long term straightening of the deviated septum. It is not uncommon for both septal and pyramid deviations to be corrected at the same time A deviated septum is corrected by having a septoplasty to improve breathing. This is normally addressed by correcting the abnormal curvature of the nasal wall consisting of the septal cartilage (the quadrangular cartilage) and bones at back (vomer and ethmoid bone). This can be done with a closed (endonasal) approach. A localized deviation or spur is purely a functional problem and has no translation to the external shape of the nose. A crooked/twisted nose usually involves more then just surgical repair or partial removal of the inner quadrangular septal cartilage . Having a septoplasty alone does not mean you will see a external physical change regarding the asymmetry of your nose. A crooked/twisted nose could involve many or all components of the nose cartilage and bone structures from the top/down (cephalic/caudal) region of the nose this would involve anything from the bony pyramid (upper third of your nose) all the way down to the caudal septum (deviation in this region is known as having a caudal deflection), nasal spine & maxillary crest. From the front/back (anterior/posterior) region of the nose this would involve anything from the side of the bridge (medial section of the bony pyramid) of the nose to the most lateral aspect of the nasal bones, or to where the quadrangular cartilage adjoins to the maxillary crest, nasal spine, vomer and perpendicular plate of the ethmoid bone. Sometimes the aforementioned bones need to be corrected to assist with aligning the nasal wall. . The pair of upper lateral and lower lateral cartilage, and medial cartilage are usually evaluated and those which are found asymmetrical after all other corrections to the septum has been made will be modified in this type of surgery. Technically this is referred to as having a septorhinoplasty because there will be a visible cosmetic change to the external shape of your nose. Authors classify crooked noses in three basic variations. However, it is important to realize that any of these three categories may be found in various combinations with each other. The C-shaped and inverted C-shaped noses represent the paradigmatic expression of type 1 deformity. The midnose is invariably involved. Tip-definition point and nasion can be correctly located on the midline axis. Type 2 crooked nose includes S-shaped and inverted S-shaped. The three framework arches (bony vault, cartilaginous dorsum, and inferior nasal third ) are the most frequently involved with variable combinations of convexity/concavity. Interdomal midpoint and midline rhinion are often out of the midsagittal axis. The typical laterally deviated nose appears straight in terms of alignment of the nasal structures but presents different heights of the two halves. The interdomal midpoint is invariably displaced off center of the midline axis. The angulation may start at the nasion or the rhinion. When the angulation is located at the nasion the halves of all three nasal arches present different heights. Angulation starting at the rhinion implies a straight or near-straight bony pyramid. The crooked nose should be considered an anatomical 'three-level unit": skin-soft tissue envelope (SSTE),bony- cartilaginous framework, and internal lining. Each of these 3 layers plays a specific role for making the nose appear crooked. Total septal reconstruction of the quadrangular cartilage maybe required in severe cases where there is extensive post traumatic or iatrogenic alteration of the cartilage. According to above authors reshaping techniques under those conditions provides poor long term functional and cosmetic results because the original deformities tend to reoccur. Camouflage procedures are used to achieve better symmetry of the nasal contour anatomy &/or emphasis some crucial surface landmarks (rhinion, tip definition points, pronasale, colemellar break, subnasale). Autogenous softly crushed septal cartilage, remnants of the cephalic alar resections, & mature scar tissue are the authors preferred additive camouflage material. The poor success rate of septum surgery reported by many studies is probably due to the failure to treat concomitant valve derangement & alterations of the lateral nasal wall. 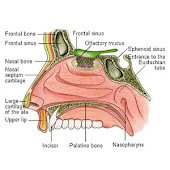 In fact, concomitant surgery on the nasal lateral wall is often required for a satisfactory functional outcome. Precise mini-invasive endoscopic procedures on turbinates and ostiomeatal complex produce excellent functional results. Conventional osteotomy techniques do not always accomplish what was intended. Double and in special cases, triple osteotomies are necessary to mobilize completely the bony pyramid and change excessive broadness, convexity, or bowing of the nasal lateral walls. An often neglected region is the premaxillary area including the inferior nasal spine and the premaxillary wings.